Marlon Brando is a very famous American actor who publicized the Method acting. He was born in 1924 in Nebraska and had a European descent by birth. He is considered to be the most distinguished actors who became famous for his role Terry Malloy in On the waterfront. He earned an Academy award for two of his films On the waterfront and The Godfather. "Never confuse the size of your paycheck with the size of your talent "
Some of his other famous films were A street car named desire,Viva Zapata, Julius Ceaser, Etc. He was an advocate of many movements like Afro-American and American Indian movements. He championed the cause of these people in America. So we can say that he was also a social activist of that period. According to the listing by the American Film Institute, he is the fourth in the list of 25great male legends (actors) till date. He has said many meaningful words and quotes about acting. He says that the reward you get in the form of money is never a judgement of your skills as an actor. 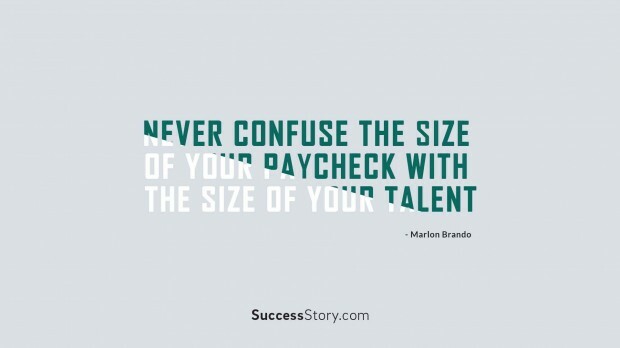 The paycheck may be small but your talent may be 10 times the money you earn. Doesn't it hold true for everybody? You may be highly proficient at doing a particular job. It is not the salary, which speaks about your talent. It is the achievement and the good name you earn which make you distinct from others. In one of his brilliant quotes he has asked if laughing is the best medicine,what can be the worst? I think it is tears.Grief wipes away the beauty of the face and the soul,Isn't it?